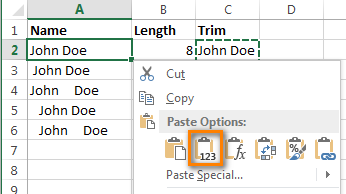 3 quick ways to remove extra spaces between words or delete all spaces from Excel cells. 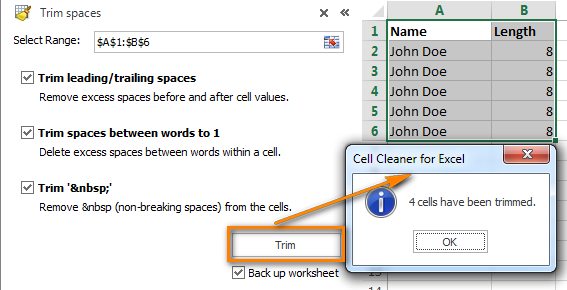 You can use trim formula, Excel Find & replace or special Excel add-in to clean up cells' content. When you paste data from an external source to an Excel spreadsheet (plain text reports, numbers from web pages, etc. ), you are likely to get extra spaces along with important data. There can be leading and trailing spaces, several blanks between words and thousand separators for numbers. Consequently, your table looks disorderly and becomes difficult to use. It may be a challenge to find a customer in the Name column since you search for "John Doe" which has no excess spaces between the names while the way it looks in your table is "John Doe". Or numbers can't be summed up, and again extra blanks are the ones to blame. In this article you'll find how to clean up your data. Add the helper column to the end of your data. You can name it "Trim". Copy the formula across the other cells in the column. Feel free to use some tips from Enter the same formula into all selected cells at a time. Replace the original column with the one that has the cleaned data. Select all cells in the helper column and press Ctrl + C to copy data to clipboard. Now pick the first cell in the original column and press Shift + F10 or the menu button . Then just press V.
That's it! We deleted all excess blanks with the help of the formula trim(). Unfortunately, it's a bit time-consuming, especially if your spreadsheet is rather big. This option needs fewer steps, but allows only deleting excess spaces between words. Leading and trailing spaces will also be trimmed to 1, but will not be removed. Select one or several columns with the data to delete spaces between words. Press Ctrl + H to get the "Find and Replace" dialog box. 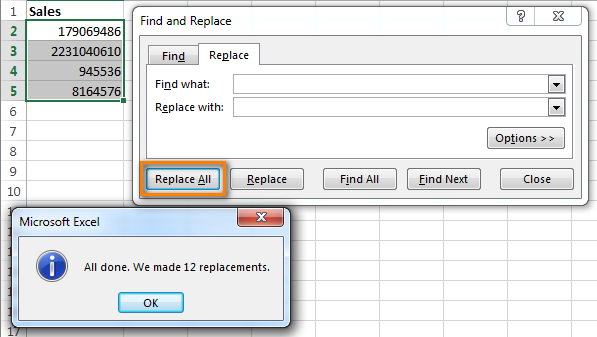 Click on the "Replace all" button, and then press Ok to close Excel confirmation dialog. If you often import data to Excel from external sources and spend much time polishing up your tables, check out Cell Cleaner add-in for Excel. This helpful tool will clean data imported from web or any other external source. It removes leading and trailing spaces, excess blanks between words, non-breaking spaces, line breaks, non-printing symbols and other unwanted characters. This add-in also converts words to UPPER, lower or Proper Case. And if you need to change text numbers back to number format and delete apostrophes, this will not be a problem. Download and install Cell Cleaner add-in for Excel. Select the range in your table where you want to remove excess spaces. For new tables I usually press Ctrl + A to process all columns in a go. The Cell Cleaner pane will open on the left side of your worksheet. Just select the needed checkboxes, click the Trim button and enjoy your perfectly cleaned table. Isn't it faster than with the two previous tips? If you always deal with data processing, this tool will save you hours of precious time. Suppose, you have a workbook with numbers where the digits (thousands, millions, billions) are separated with spaces. 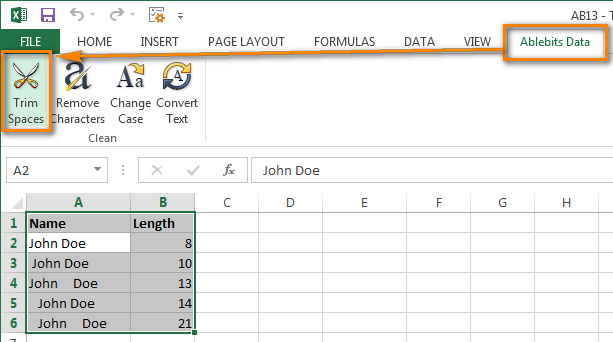 Thus Excel sees numbers as text and no math operation can be performed. Press Ctrl + H to open the "Find & Replace" dialog box. Press Space bar in the Find What field and make sure the "Replace with" field is empty. Click on the "Replace all" button, and then press Ok. Voila! All spaces are removed. Here A1 is the first cell of the column with numbers or words where all spaces must be deleted. 132 Responses to "3 ways to remove spaces between words / numbers in Excel cells"
Just wanted to give my thanks. That SUBSTITUTE command just saved 2 days of data inputting in a 2000 rows spreadsheet. Is there a formula or a function that can be placed into a cell in excel that will automatically restrict space entery, at the time that data is being entered, to 1 space between characters. Also how would I lock the formulas in cells, so they cannot be changed but allow data entery into the cell.